As Violent Month Ends In Afghanistan, U.S. Hands Off Control Of Key Valley : The Two-Way Insurgents have increasingly targeted civilians. In the Kunar Province, The New York Times reports, the U.S. will give control of the Pech Valley to Afghan units so that the Americans can concentrate on protecting more populated areas. 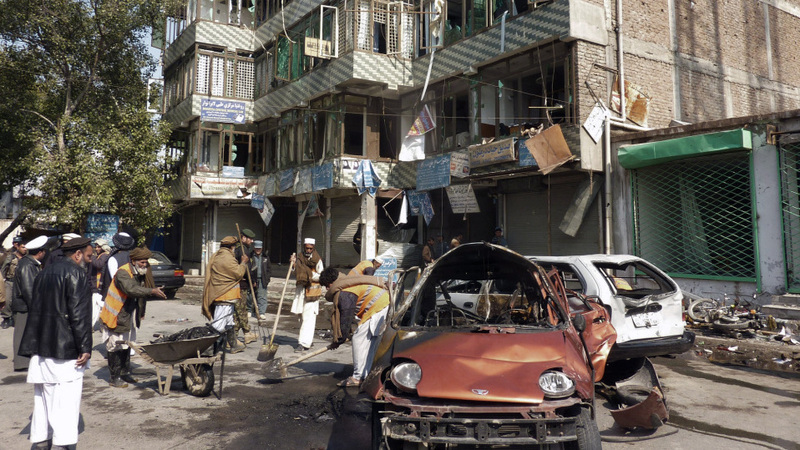 Last week in Jalalabad, Afghanistan, suicide bombers rushed into a bank building. Forty people died in the explosion and from point-blank shots fired by the attackers. "Kabul is shaken," a clothing salesman in the Afghan capital tells NPR's Quil Lawrence. As Quil reported earlier today on Morning Edition, "a long calm" in major Afghan cities has been shattered in recent weeks by attacks on civilians by insurgents. NATO and American commanders, Quil says, believe the upsurge in such attacks is in part because of their success in "degrading" the capabilities of the Taliban and other anti-government forces. Those fighters are now striking softer targets — civilians. In other news about the war in Afghanistan, The New York Times reports today that "after years of fighting for control of a prominent valley in the rugged mountains of eastern Afghanistan, the United States military has begun to pull back most of its forces" from there. American officials, the Times says, say the withdrawal from Kunar province's Pech Valley and the handing over of control to Afghan army units "matches the latest counterinsurgency doctrine's emphasis on protecting Afghan civilians." The U.S. troops will now concentrate on Kunar's "more populated areas." The Times adds that "at least 103 American soldiers have died in or near the valley's maze of steep gullies and soaring peaks."